1. Make sure that there are no air bubbles in the motorized syringes or in the tubes. If you see bubbles, run the Actions | Debubble routine in Front Panel as usual. 2. Check that the microtip can move freely, and that it falls back into position if it is lifted up. The tip should be “spring loaded”, or, to be more precise, gravity loaded. If it does not fall back, adjust the angle of the “guide loop” and the position where the guide loop grips the microtip tubing. Normally, the microtip should meet the arm at right angles (viewed from the front and from the side). 3. You can adjust the position where the tip is dispensing into the wells by pressing the Pause button during an experiment. Change the position with the arrow keys or the mouse on the diagram shown. 4. If you think there is a mistake in the definition of the plate, you can make corrections of up to around 1 mm by selecting PlateLoader | Calibrate plate in Front Panel. 5. If the tip is too high, some drops may be missing. If the tip is too low, the drops may be positioned irregularly. On the whole it is better for the tip to be too low than too high. 6. We recommend greasing the outside of the tip. If protein sticks, it can then be wiped off and fresh grease applied. Don’t get grease in the end. (If you do get grease in the end of the tip, it will be cleared after one or two plates.) You can use petroleum jelly (Vaseline) or silicone grease. 7. Try to keep the tip vertical. 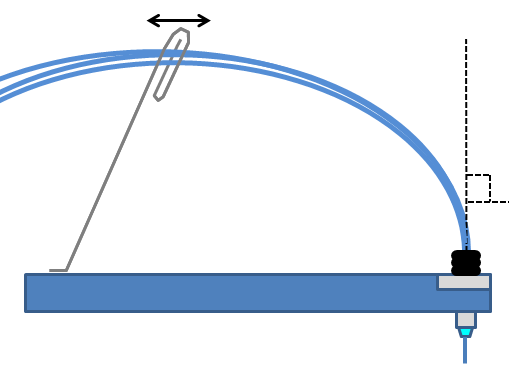 If it is not vertical, part of the drop may stick to the tip. The tip can be straightened with the fingers. Note that it may move back slowly towards its original position. 9. When you are dispensing plates with two drops, you may find that the first drop to be dispensed is smaller than the second. This indicates that part of the drop is sticking to the tip. This material ends up in the second drop. (If part of the second drop is subsequently picked up it will end up in the next reservoir, so the second drop will typically be the correct size.) Check points 5 to 8 above. 10. The tip is almost completely inert and can be cleaned with acids, bases, detergents etc. We recommend cleaning with Hellmanex II, which is a cleaning solution that can be obtained from VWR. (We have not tried it’s successor Hellmanex III.) It is used as a 1% solution in water. We recommend sucking a little solution into the tip and flushing with buffer after use to remove the cleaning solution. We clean our tips roughly once a month, or when we see a problem. Patrick Shaw Stewart, June 2011.